FDS Super Mario Bros. 2 (JPN) "warps, Mario" in 08:20.57 by Bisqwit. 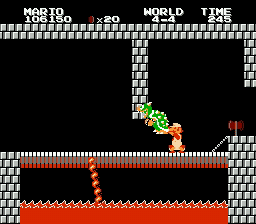 The total completion time of a warp-using Super Mario Bros 2 run from poweron to hitting the axe has now reached 8:20.57, which is 0.86 seconds faster than the previous version which was released a few days ago. This time we see Mario eat a mushroom and a fireflower. Lots of more action than before. Also more glitches. Read the submission comments for more details. In the strange-looking screenshot in this movie entry, we see Mario ducking and shooting at the same time. This is the real Super Mario Bros 2. Yes, this game is real. It just wasn't released in the USA. It was later ported to SNES, and released as "Lost Levels".